﻿ We're the Top Audiovidual Website in Spain!! 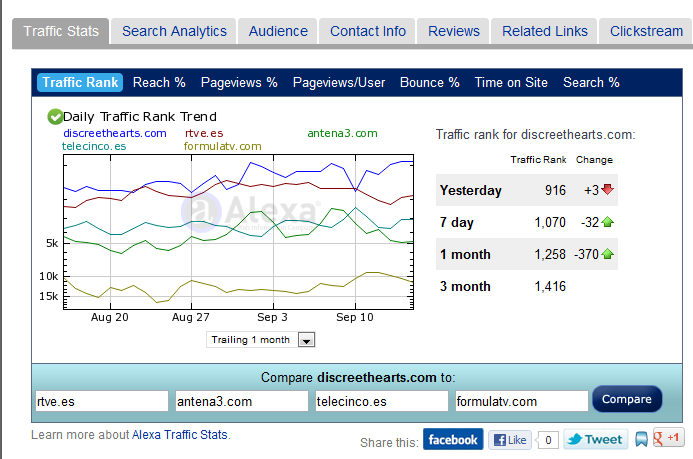 In the past 30 days, DiscreetHearts.com has become the top audivisual website in Spain, ahead of traditional TV stations' websites. We have a much larger audience in the United States and all Latin American countries than any of Spain's large media companies' websites, though our audience within Spain is a little smaller than theirs. The global acceptance of DiscreetHearts.com allows us to further our project that is fulfilling its calling as an online TV and music channel where our web series is just a starting point. In the coming weeks DiscreetHearts.com will continue to open new sections, the community, the web series channel and the music channel, which will continue to fill out our multifaceted platform. Our web channel aims to provide a platform for hundreds of visual artists who are committed to the dissemination of their works by traditional media channels.